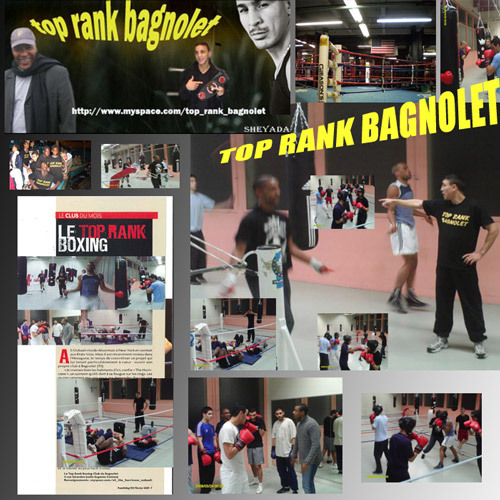 The Boxing gym Top Rank of Bagnolet was created, on the January 1st, 2007 by brothers Ali and Nordine Oubaali and opened his doors on the December 1st, 2007 .The gym is located in gymnasium Eugénie Cotton, 8, street Girardot, 93170 Bagnolet and will be open monday to friday between 8pm until 10.30pm and close saturday and sunday , All level is teached. The trainers: Ali and Nordine Oubaali, Franck Kanon and Joseph Germain will make a joy to receive you . The true pro of the discipline. With kindness and heart on top of that. In this opportunity, we want sincerely thank all the elected representatives of the city of Bagnolet because without them all our efforts and requests of the young persons of Bagnolet would have been vain. Quotation of Mr Marc Everbecq, Maire of the city of Bagnolet : Welcome to Top Rank to whom I wish to develop for the pleasure of the young persons of Bagnolet who wait for a long time to be able to play this sports discipline in our city.